I do rabbit and guinea pig boarding. depending on how far I have to travel and what needs to be done. I'm insured although insurance doesn't cover for rabbit and guinea pig boarding. WILL BE NERVOUS OF DOGS THEN THIS IS NOT BEST PLACE FOR THEM. All hutches are in a summer house or shed.all rabbits and guinea pigs are locked away before dark. I have one 5ft double hutch that is outside not in a shed or summerhouse. Has a hugger cover for protection from wind and rain. Heat pads available for cold weather. Rabbits and guinea pigs get access to a run during the day. All runs have hutch in for shelter. PLEASE NOTE ALL RABBITS AND GUINEA PIGS ARE KEPT OUTSIDE. During the day weather permitting rabbits and guinea pigs will be in a run. Hutches are cleaned and disinfected between each guest. I take Rabbit that are not vaccinated but must be stated on the form and left at owners choice and risk to any problems arising in not being vaccinated. 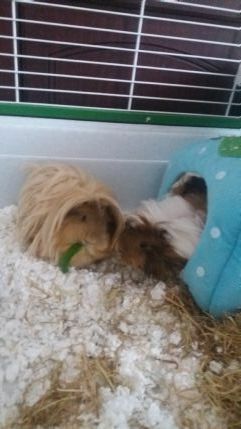 Guinea pigs have their own hutch and run and do not mix with other . Food bowls and water bottles are sterilised. please supply enough dry food for your pet/s while staying with me as change of food can upset tummys. bonded pair £9 a day. Includes drop off and pick up days. For boarding i ask for £10 non refundable deposit. booking is not confirmed until £10 deposit has been paid. Please be aware if you cancel you do Not get your £10 deposit back. Home visits from £14 plus any parking fees. Pick up and drop back service applies for boarding. I no longer accept cheques. If you require your pet to stay longer than stated on the booking form then you must contact me before that date. Any extra days are charged at daily rate. 5 days your pet will be put up for rehoming. If you have contacted me to keep your pets longer than stated on the form but have not paid for any extra days then after 7 days your pet will be put up for rehoming. Any pets that becomes unwell while in my care I will take them to my vet,any vet fees to be paid on collection of your pet. No responsibility is taken should your pet become unwell or die while in my care. Where possible I will contact you before any vet treatment. Payment is arrival day and departure day regardless of time. Payment... is to be paid in full on drop-off day by cash only or by bank transfer at least one day before drop off day. Left my baby boy Mr.B a dwarf rabbit for couple of days . First time I leave him under someone's else care and I'm so happy ,I have been receiving pictures and I loved the way everything is shorted for rabbits ,hopefully the next time will be nice weather so he can play out in the garden. My two bunnies stay at Lynne's every time I go away. She takes great care of them and sends lots of pictures and updates whilst I am away. They always come home very relaxed. I would highly recommend Lynne for taking care of your pets. We are very lucky to know Lynne. I had to fly to India as my husband's mum was on life support and on the day before my departure, my beloved Squeaky ( a 15 year tabby) broker his front leg. I had to board a early flight next day. I was able to speak to Lynne around 10 pm and explained the situation. Lynne took Squeaky to the vet next day and kept us informed all the way through. When Squeaky was ready to come home, she lent us a cage for Squeaky to recuperate. Sadly though Squeaky did not make it through, we are so grateful to Lynne for taking Squeaky to the vet and taking care of him. My other cat Sophie is also so well cared for when Lynne looks after her. I get photos daily, and updated about their food and how they are. Lynne also made special effort to make sure the home was cool by placing fans around the home and making sure there was plenty of fresh water around too. I will highly recommend Lynne to look after the beloved pets out there . Lynne genuinely cares about the pets and highly trust worthy. My cats were so well after by Lynne Yes Lynne will taking of Sophie in the future when we go away. We left our rabbits Tom&Jerry with Lynne for almost 2 weeks. Lynne took very good care of them and she was keeping us updated by sending photos and videos of our little ones almost every day. We will definitely leave our bunnies with Lynne again as she is amazing with pets. Thank you Lynne for your help and kindness! Lynne looked after our rabbit Maple for 2 weeks over the summer. She was very well cared for and even had her nails cut. We also received numerous photos and messages which was reassuring. I would highly recommend Lynne and would not hesitate to use again. I was very happy with Lynne looking after our rabbit, Daisy. She did a great job and sent us lots of photos! I'd definitely recommend her! Lynn looked after our bunny so well and kept him indoors and gave him lots of playtime! We were worried leaving him for the first time but we now know we would definitely bring our bunny, Kyoko, back here to stay if needed! This is the third time Lynne has boarded my rabbits and as always she was amazing. she cut their nails which saved me having to take them to the vet and pay the vet. She kept me updated with photos. I'm sure they know when they're going there and they love it there. I have recently used Lynn for my rabbits while we were on holiday and they were looked after amazingly. I would use Lynn again her service is fantastic and she's lovely. From the minute you meet Lynne (who is lovely) you know that she loves animals and really understands their needs. She looked after our little bunny Hops so wonderfully well and even sent us pics to keep us updated. Very accommodating. Hops even came very comfortable using his litter tray! Would thoroughly recommend ! We left Lynne our rabbits over Christmas. They are indoor rabbits and were very well looked after by Lynne! She had them in a summer house, and gave them heat pads for the night! She also took them out every day for a couple of hours and sent us pictures so we could see how happy they were! I definitely would recommend Lynne and use her services another time, should we need them. This is the second time Lynne has boarded our two bunnies she keeps us updated with photos.she clearly love animals and is very experienced.this time she also done home visit daily for our two cats.We have never had anyone come to our house to look after our cats she has excellent references for home visits Disclosure all of which I saw. She went above and beyond my expectations we arrived home to a little diary of what went on each day also had photos sent to us daily everything was clean and tidy.. I would never put my cats in a cattery again will always ask Lynne to visit. I didn't think it was safe to leave the rabbits in our garden as they wouldn't be able to be locked away at night. Lynne is a lovely lady who you know has a genuine love of all animals. My two rabbits boarded with her for two weeks and I received near on daily messages and pictures letting me know what they were up to, giving me real peace of mind. I wouldn't hesitate in recommending Lynne. Very happy with Lynne looking after my bunny. She even sent me picture updates of what he was up to! Also very accommodating when I needed an extra few days care. Lynne was kind enough to take on my bunny at short notice after my original plans fell through for bunny care. Located near Hounslow West station I cannot fault Lynnes service offering at all. Not only did she come in come in competitively priced, she also was kind enough to come and meet me at the station on drop off and pick up and her friendly and personable nature made me confident that I had left my bunny with the right person. On a daily basis Lynne was kind enough to send me pictures of my bunny and as such, I was content that the bunny was in good hands. I would therefore not hesitate to leave my bunny rabbit with Lynne again. Lynne has been very accommodating and helpful looking after Mocha and Sage whilst was away of vacation. I highly recommend Lynne services. I found Lynne on findpet boarding. Com She was very professional and booked my rabbits in straight away. Very reasonable and affordable price for boarding. Thanks is the first time I used bunny boarding. But will return to Lynne every time we need this service. She was a lovely lady and even emailed me photos of our rabbit while we was away to let us know how she was. She even helped to litter train our rabbit . Great experience. Would highly recommend. I found Lynne on this website and I knew immediately from her caring phone manner that she was the person to look after Bernard our four year old rabbit, and she didn't dissapoint! The environment was meticulously clean and perfect for Bernard to enjoy and explore on his daily run. Lynne didn't disappoint either. A true professional with over thirty years experience. We were emailed daily pictures of a contented Bernard enjoying his surroundings. I would now only ever take Bernard to Lynne because the love and care that he received in two weeks was beyond what we expected! I actually think he is missing Lynne and his cuddles!